You know what being in the zone feels like—you're focused, you’re on your game. Then you try something that’s really not your skill set and it fails. Badly. In basketball we call that a heat check. You’ve made five shots in a row, blocked a shot and stole the ball—you’re on fire, why not throw up a three-pointer? That’s a heat check—clearly you weren’t hot enough. On Sunday night, somewhere within the confines of Toronto ad agency Sid Lee, a group of creatives and strategists checked their heat. The verdict? #WeTheNorth is still hot. 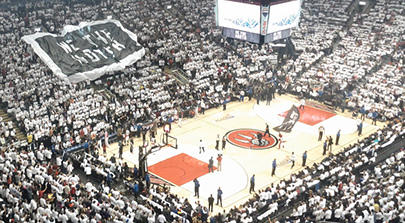 When Sid Lee (Marketing Magazine’s agency of the year four of the last five years) was chosen by the Toronto Raptors as their new agency of record in January 2014, no one was thinking about playoff basketball in Toronto. The team had just traded Rudy Gay, one of their marquee players. The prevailing wisdom in raptorland centered around a strategy to lose games in an effort to go after a higher pick in the NBA draft. It seemed the basketball gods had other plans for the purple and white – bestowing upon them a weak eastern conference, decent schedule and the capacity to park egos at the door in favour of team play. To pretty much everyone’s surprise the Raps began winning. Basketball in Canada is experiencing great success right now. The first generation to grow up watching professional basketball within Canada has come of age. Two years in a row a Canadian has been taken first overall in the NBA draft and not long ago the iconic Canadian basketball ambassador Steve Nash earned back-to-back NBA MVP titles. Cultural barriers have been overcome. Most Canadians can now watch a basketball game and basically understand what is happening. As Forbes pointed out last year, immigration trends in Canada since the mid-70’s have also played a critical role. New Canadians love them some basketball. Today, in the coveted 12–17 age range, Canadians are regularly choosing basketball over hockey and soccer. In Canada, for perhaps the first time ever, the timing is right for a national conversation around basketball. Sid Lee is Agency of the Year for a reason. They figured out the equation no one else could. It took 18 years for someone to realize that Canada loves nothing more than an underdog. Sid Lee understood that the Raptors play basketball against teams that don’t respect them in a league the routinely forgets the Raptors exist. Good creative sees opportunity where others see a problem. #WeTheNorth is a hashtag, brand promise, inspiring proposition and statement of purpose. Anyone who’s ever tried to create just one of those things knows the challenge, imagine nailing all four with just three words. That’s brand communications at its finest. The messaging didn’t need to be about basketball anymore. Sid Lee would pit the Toronto Raptors and the nation of Canada against the world. Truthfully, Raptor teams of the past might have left that message ringing hollow and contrived. Tracy McGrady didn’t embody Canadian values, but Demar Derozan does. He works hard first, talks last and leads by example—exactly how Canadians prefer to see themselves. Yet still, for a team that has struggled to get good players to come north of the border, it took real guts to unleash a brand message that accentuated that dividing line. Since trading Rudy Gay last season the Toronto Raptors brand has enjoyed an upward trajectory. Sure, they lost in game 7 of the quarterfinals but the streets of Toronto were filled with fans and across the country record numbers of new fans tuned in to watch that game. In fact, last years playoff series with Brooklyn was the most watched NBA playoff series in Canadian history. Releasing the #WeTheNorth message, albeit much earlier than Sid Lee had planned, gave Raptor fans a way to show off their team while acting as a desirable point of entry for all Canadians. So, this past Sunday, the Raptors took to the court for a sold-out preseason game in Vancouver with an atmosphere that rivaled the playoffs in Toronto. TSN broadcast the game, something the network itself pointed out as almost unthinkable just a year ago. Before the first half ended, #WeTheNorth was trending #1 nationally on Twitter. The Raps went on to beat the Sacramento Kings in a meaningless tune-up for the regular season. For #WeTheNorth brand managers, that meaningless tune-up and its sequals in Montreal and Toronto are proof that their brand and its message is still red hot. Red hot and nothing but net. Ice Bucket Challenge - Hot or Not? Did you shake it out?